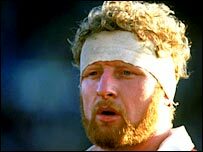 Ex-England second row Maurice Colclough has died at the age of 52 after a long battle against a brain tumour. Colclough won 25 England caps, was a member of England's 1980 Grand Slam team and twice toured with the Lions. Former team-mate Bill Beaumont said: "Maurice was a powerful and very athletic rugby player. "He made a massive contribution to the clubs he played for, to his country and to the Lions. He had a huge heart and will be greatly missed." Born in Oxford on September 2, 1953, Colclough was educated at the Duke of York's Royal Military School, Dover, and Liverpool University, playing for Liverpool RFC. He went on to become one of the first Englishmen to play in France, where he captained Angouleme. He later played for Wasps and Swansea. He is survived by his wife Annie and their five children.